អ៊ូហាន (ចិនសម័យ: 武汉; ចិនបុរាណ: 武漢; ភិងអ៊ិង: Wǔhàn ទំព័រគំរូ:IPA-cmn, Wuhan) is the capital of Hubei province, People's Republic of China, and is the most populous city in Central China. 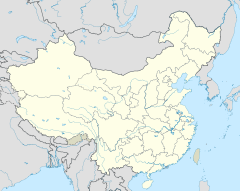 It lies in the eastern Jianghan Plain at the intersection of the middle reaches of the Yangtze and Han rivers. Arising out of the conglomeration of three cities, Wuchang, Hankou, and Hanyang, Wuhan is known as "the nine provinces' leading thoroughfare"; it is a major transportation hub, with dozens of railways, roads and expressways passing through the city. Because of its key role in domestic transportation, Wuhan was sometimes referred to as the "Chicago of China." It is recognized as the political, economic, financial, cultural, educational and transportation center of central China. The city of Wuhan, first termed as such in 1927, has a population of 10,020,000 people (as of 2011), with about 6,434,373 residents in its urban area. In the 1920s, Wuhan was the national capital of a leftist Kuomintang (KMT) government led by Wang Jingwei in opposition to Chiang Kai-shek, as well as wartime capital in 1937.